Officer Brandon Mitchell previews the LoJack tracking computer in his patrol car. Photo courtesy of the LBPD. Yesterday, the Long Beach Police Department unveiled its new eight LoJack tracking computers which will help the department track LoJack-equipped stolen vehicles. 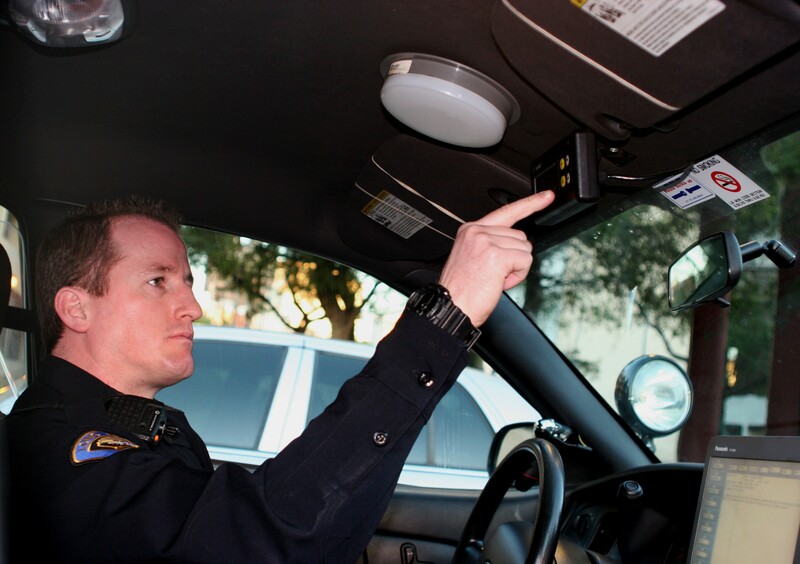 Installed in LBPD vehicles, the computers will receive silent transmission signals emitted from a small radio transceiver hidden in a LoJack equipped vehicle that alert officers to where the stolen vehicle is. Officers deployed in patrol vehicles and helicopters equipped with the LoJack system follow these signals, which can lead officers directly to the stolen vehicle. LoJack System is a time-tested theft recovery solution with a 90 percent recovery rate that enables law enforcement agencies using the computers to track down LoJack-equipped cars, trucks, SUVs, motorcycles and construction equipment. Given the 15.6 percent percent rise in auto thefts, the gracious donation from Ford dealership owner Henry Caruso comes at a much-needed time when the Department’s budget has been slashed and creative ways to keep law enforcement active are needed. “We’re always looking to maximize our ability to locate stolen vehicles and partnering with Pacific Ford affords us the opportunity to increase our number of LoJack equipped vehicles to 35, at no cost to the taxpayers,” said Chief Jim McDonnell at yesterday’s conference showcasing the computers.